How and where to catch a Sole? That seems to be the main question I am being asked at the moment, and with the number of Sole that are around at the moment it is a pretty good question. There are quite a few coming from the western end of Chesil, especially West Bexington and Cogden. These are not the only marks for Sole in the area. Preston Beach can be alive with them at this time of year. As few locals fish Preston at this time, it is mostly ignored as a Sole mark, but plenty of holiday makers that have gone fishing from the caravan park at Bowleaze on an evening have done well. If you are after a specimen Sole then risk the tackle losses and head down to Church Ope Cove on Portland at night. The largest fish do seem to come in September and October from there. One of the main differences between the Sole caught on Chesil and elsewhere locally, is that it is possible to catch them during the day on Chesil. Sole are not the only species to have shown up recently. Scad and Garfish are being caught in good numbers all along the coast. That is normally a good indicator that all the summer species have shown up and the fishing for the next couple of months will be at its peak. Scad are normally caught from dusk onwards, and can be caught very close to the shoreline. 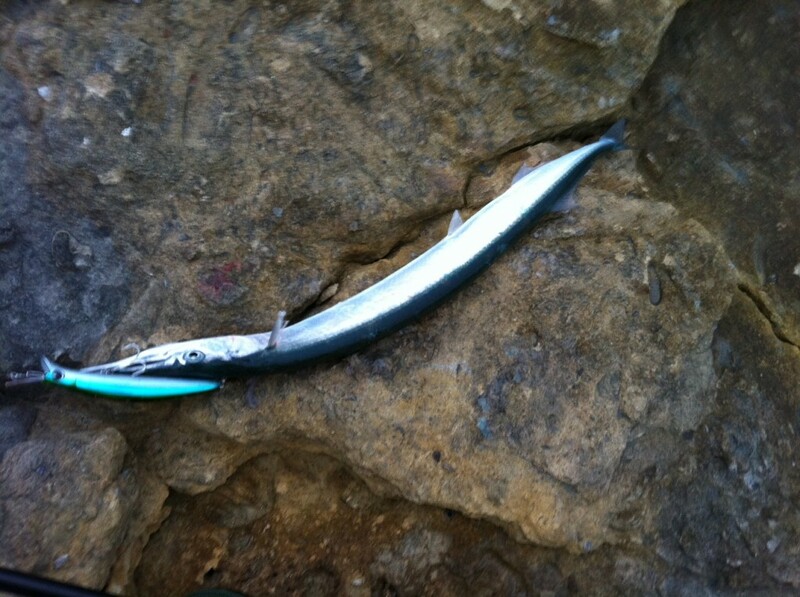 Mackerel feathers, lures or float fished Mackerel strip will all take Scad. Lure and float tactics work for Garfish as well, but you need to scale down your hook and lure sizes to size 4 hooks. 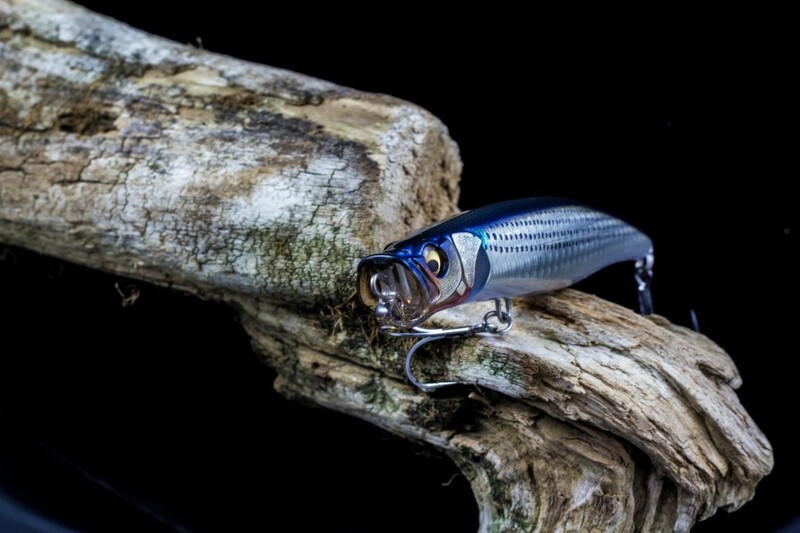 Small surface lures like Seaspin Pro-Q 90 or IMA Kimono’s work well. Fishing competition I don’t fish many competitions any more, but the BIg FIsh Event, being run by Lyme Regis Sea Angling Club, looks like it will be a great competition for a great cause. It will be run over a 33 hour period and you can fish as little or as much of it as you like. What really appeals to me is that the main prizes are for a number of different species. This allows anglers with different passions to concentrate on what they are good at. 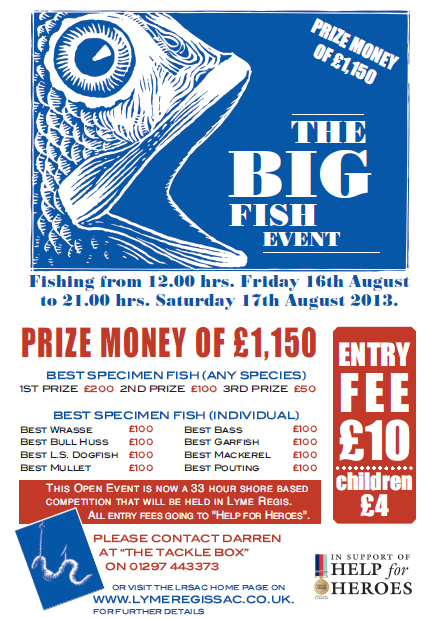 * This event is a 33 hour shore based fishing competition that will take place from 12.00 hrs on Friday 16th August until 21.00 hrs on Saturday 17th August. All proceeds to go to Help for Heroes. * The venue is from the western point of Monmouth Beach to Church Cliffs at Lyme Regis. * NO FISHING from the pontoon in the harbour – this area is strictly out of bounds. * Competitors will be able to fish for as much of the 33 hour period that they wish to fish for a competition entry fee of £10 (Children £4). Children will be given a voucher from the Tackle Box equal to their prize win. You only need to sign in once for the competition. When you have finished fishing please put your signing in card in the raffle bucket outside The Tackle Box. * As this is a 33 hr. competition there will be a “rolling weigh in” to conserve fish stocks therefore any fish caught can be weighed in and then returned to the water if required. This weigh in will take place on the competition scales at The Tackle Box. Saturday 17th August 08.00 hrs until 21.30 hrs. WEIGH IN WILL CLOSE AT 21.30 hrs. * All current leaders will be listed on a Leader Board that will be displayed outside The Tackle Shop during daylight hours to allow competitors to target specific fish to catch. * The final results and awards will be announced at the Cobb Arms, Lyme Regis at 21.45 hrs. * No Allis or Twaite Shad, Silver Eel, Sea Trout, Tope, Salmon or species of Rockling to be weighed in. * You must bring this card to The Tackle Box if you weigh in a fish. * All decisions of the organising committee are final. Reviews: Watch out for a review of the new Megabass Xlush lure this week and I will be featuring West Bay as the next fishing marks article. Portland Harbour: Calm with clear water. Chesil Beach forecast: The next few days should be good on the beach, with almost all the summer species around and even some surprise visitors. I have heard of some Codling and Whiting being caught from around Chesil Cove area. I am fairly certain that they are just a few stragglers and not the start of the autumn Cod run. Mackerel should be around in abundance all along the beach, along with Gurnard, Garfish and Scad at dusk. Bream fishing has been reasonable from the Ferrybridge area, but I have not heard of any Trigger fish coming from the wreck of the Royal Adelaide. I fear we may have seen the last of them. Portland: As predicted the other day, lure fishing around Portland has been very good. Fishing all along the rocks and ledges from Chesil Cove, round Portland Bill and on the ledges on the East side around the crane and beyond have produced, Bass, Wrasse and Pollock. I expect similar results today. I have seen plenty of anglers successfully float fishing for Wrasse on the ledges with Ragworm. It is possible to fish on the bottom with bait, but expect high tackle losses. Church Ope Cove will fish well tonight at dusk, as high water is only a couple of hours later. Pollock, Mackerel, Garfish, Scad and Bass can all be caught at the same time. Portland Harbour: Small Bass and small Bream seem to have made up most of the catches for the past couple of days. I would expect plenty of Scad around Ferrybridge tonight. They often travel with the Mackerel shoals and can attract Bass. Weymouth Bay: Both piers continue to produce lots of different species and are easy to fish marks. The harbour has some big Mullet cruising around in it. If I had the time I would be targeting them with bread or dog biscuit on the surface. Preston Beach will produce flatfish and the odd Bass, and Sole after dark.